Ex-SANDF colonel William Endley is due home soon. South Sudanese President Salva Kiir pardoned former South African military officer William Endley to build confidence in the country's new peace process, his government explained. But analysts believe it's going to take a lot more than such symbolic gestures to preserve this peace where similar previous ones have failed. "President Kiir did it to show his commitment to peace and his commitment to the opposition," said Peter Bior, spokesman for South Sudan's embassy in Pretoria said about the pardon of Endley. "It was a confidence-building measure." Kiir announced his pardon of Endley during celebrations in the capital Juba on Wednesday to mark the launch of yet another peace process. Endley was due to be released on Thursday and to return to South Africa "in due course", Pretoria said. 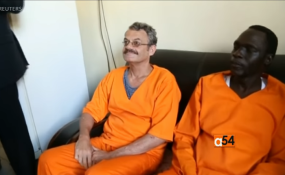 Endley, an ex-South African National Defence Force colonel, was serving as a military adviser to Kiir's old foe Riek Machar and was captured by Kiir's forces in 2016 after the breakdown of the last peace deal between Kiir and Machar. On 12 February a South Sudanese court sentenced him to death for espionage and conspiring to overthrow the government.